Kids have too many toys. They truly don't need much. And giving them too much stifles their thought processes and creativity. And its a waste of everyone's money. We managed to raise our children with a few dolls, leggos, a doll house and a set of Thomas trains. We also kept a running supply of bubbles, crayons and side walk chalk. Our kids have always enjoyed playing on their own and inventing their own artistic and creative games. I have NEVER heard the words, "I'm bored" and, with only one exception I can think of, visiting children usually delight in our play room and nursery and are sorry when it is time to leave. Most of the toys kids own today possess no actual redeeming quality. Which takes us to the why do kids have so many toys? Because they get a toy whose amazing draw is the noise or flashing lights it exhibits. There is little to no actual thinking or interaction going on so the child quickly becomes bored and that toy gets tossed aside. In the meantime, they have not learned how to use their brains so they expect they need to have something entertaining them or a lot of input in order to stay interested. It is a vicious cycle for sure. We could all live in smaller houses, have less to pick up and enjoy more cash in our pockets if we would focus our children's play time on creative and constructive play versus toys with flashing lights and obnoxious noise. Pots and pans along with a wooden spoon will create endless hours of play time as your little one cooks up some soup, becomes a robot and joins a marching band. When we do invest in toys, it is more profitable to avoid the pitfalls of the latest and greatest and instead invest in educational toys which can build language and motor skills. These toys are all the better if they will grow with our little ones. A ring stacking toy makes an excellent teething ring for a 6 month old, a good way to practice find motor skills for a one year old and a good method to teach colors for the 18 month old. Your little one can also practice banging the rings together and putting them in a bowl for more fine motor development. Compare that to a stuffed animal which sings some annoying song in an electronic voice when you squeeze the ear. No brainer in my book which is the better choice. For our family we have always made it a hard fast rule not to have toys with batteries. For one thing all those flashing lights and blaring sounds are not good for your little ones brain development. And when baby has a full time diet of such toys he doesn't learn to look around his environment and observe and explore. Children exposed to much stimulation tend to be fussier, have shorter attention spans and interrupted sleep habits. And, to be perfectly honest, if those weren't reasons enough to avoid such play things, I can not stand all that racket. It truly sets my nerves on edge within minutes. As your battery operated toys level increases you will find the chaos and noise level quickly increase as well. Before you know it everyone is shouting and kids are running in every which direction. We were recently at a child's birthday party where multiple children were playing with multiple noise making toys all at the same time. I couldn't make it five minutes in that room before I had to step outside. One glance at Addison and I saw he was shutting down from all the over stimulation. Truly, all baby needs for the first few months is to see faces and hear voices. Nothing else will make baby smile and giggle more or soothe that fussy little one than to hear pa sing some goofy made up song with a silly grin on his face. Up until baby is several months old they will have no interest in play things, nor the motor skills to use them. 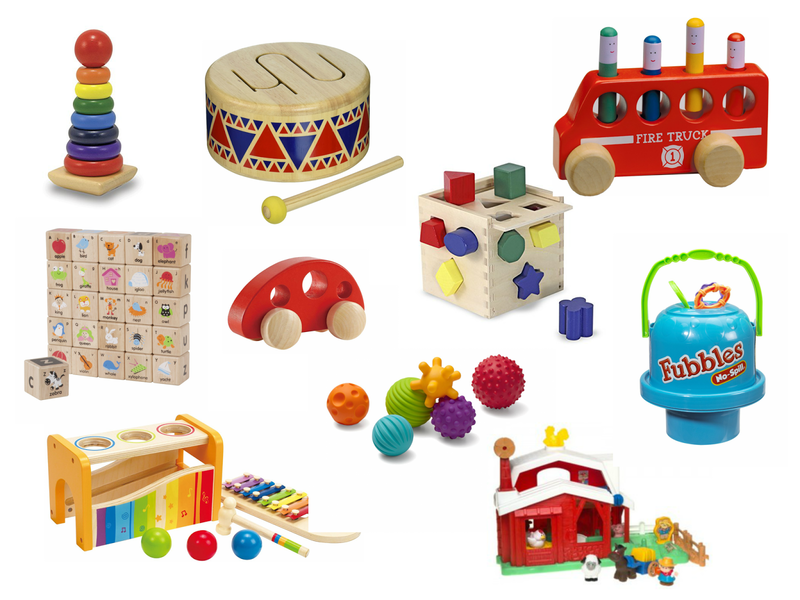 However, if you want to prepare for the first year or two there are some very nice quality toys you can invest in. I personally try to limit the plastic in our house. There are just too many chemicals and we have too many allergy sufferers. I always go for a natural wood toys when possible. We are even more adamant about this since Addison came into our world. Some studies show people with Down Syndrome are more sensitive to chemicals and the affects on brain development are substantial. I certainly don't want to do anything which could make life more challenging for him than it already is. My favorite toy companies are Melissa and Doug, Hape, Lakeshore and Plan Toys. There are lots of other good companies out there but these companies offer good quality at better prices than most and their products are readily available on the web. 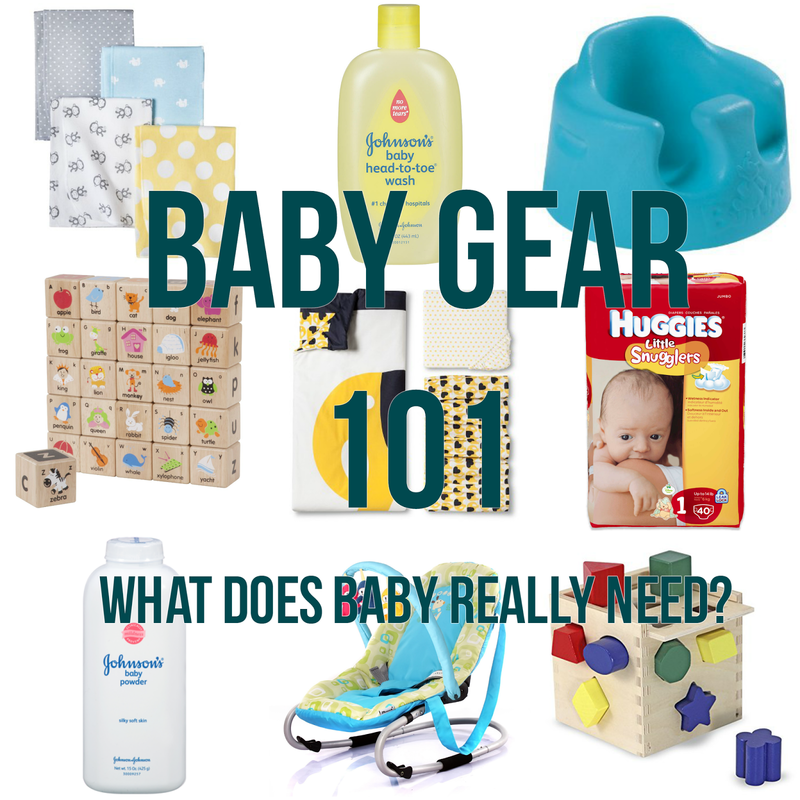 Bonus: For our newborns a favorite toy has always been a little tiny silver bell with a teething ring attached. I am sure this does not pass modern safety standards. It has been around since my brother and I were babies. Why do I love it? It is easy for baby to grasp and light enough for even the youngest of babies to get a sound out of. Even Addison with hypotonia was able to enjoy this toy almost from birth.